NEW NEW NEW!!! Double Master, 7 Queen Beds in property, 8th bed available upon request, 4 full Bathrooms, Cable TV, High Speed wired and wifi internet, great kitchen and back yard. Downstairs laundry, full bedroom, full bathroom, living room, dining room, TV. Bedroom 5 is downstairs. Upstairs, Master 1 with full bathroom, Master 2 with full bathroom, bedroom 3, bedroom 4, full bathroom in hallway. Only rented once per 31 days. Long term rentals available. Insurance home replacement rentals and executive long term furnished housing. Hardwood tile floors downstairs, new carpets upstairs. Outside: Picnic Table upon request, Large BBQ Grill, covered patio. Private swimming pool, Picnic table, deck, and more. Professional property manager, this property is new. First service day is June 16, 2016. My back up homes are located just one community over in case of a problem with this home. (Some owners do not have a back up home in case of damage from the previous guest). 4 Full Bathrooms, 2 with double sinks. Great for large groups needing to get ready. Yes, excellent central air. Nice and cold. When needed, it works great. Yes, we change them between guests or once a week. Front loaders high capacity machines. Yes, off during the summer. Property has space for 6 cars. 3 car garage, 3 car driveway parking. We provide 12 towels unless requested differently, or 1 towel per guest whichever is greater. High end large capacity fridge with freezer and ice. Show kitchen, excellent for entertaining. Excellent for entertaining and feeding the crew. Several TV's in property with cable and high speed internet. These are Samsung Smart TVs with access to the internet. Shadow Springs Golf course 1 minute away. There is 1 bedroom downstairs and full bathroom. The house is not wheelchair accessible by ADA standards, however many senior guests have said that the house works great for them. Everything is downstairs, except for 4 bedrooms that are located upstairs, and 3 bathrooms. Absolutely private pool. No one shares this with you. Yes, a huge community pool is located a block from the home. This pool is indoors and costs $1 for entry. Part of community pool center and costs $1 for entry. I have other properties that in the same area that can be made available if you need more space. Please contact me for specific requests. Ideal for family events, reunions, weddings, and birthdays. Not ideal for loud parties. Property is in poor shape and cleaning is minimal at best. No dressers in the rooms. No decor to speak of. Pool is disgusting. Hardly any TV channels work. Broken knobs and blinds throughout. 8 Bath towels on the kitchen table with a new pack of toilet paper is all you get. For $399 a night I would expect way more. Probably the worst VRBO property I've ever stayed at. On the up side, owner was super responsive and helpful though. Spoke to guest who admitted she did not stay at property. I believe this to be a fake review. There were 16 towels at the property, there are over 100 TV channels, music channels, plus high speed internet. Everything is professionally cleaned between guests. Our pools are closed when there is snow on the ground during winter, but we still service them to make them look nice. We hold a Partner of Excellence award from VRBO and Super Host status. Since the guest did not stay at the property, I do not know how this review is accurate. Property just like the pictures. Quite a bit longer to get to the strip than anticipated but still very nice! Thank you to Barry and staff for attending quickly to all issues! We rented this place for 4 family get together. Place was nice and clean and had enough room for 8 kids (ages 5 - 12) to play around. Everyone had a great time and enjoyed our stay. I would definitely recommend this place. The owner, Barry, was very responsive and easy to reach. Nice man. For 7 guys on a golf trip, the house was fine even tho a bit spartan. No dressers nor lamps nor some of the little things a house should have. OK for a group of guys who basically sleep there and then spend the day 'out' but a family stay might find it would need some help. Best host ever. He responds to your queries very quickly. The house is very spacious and neat. The community is very decent. 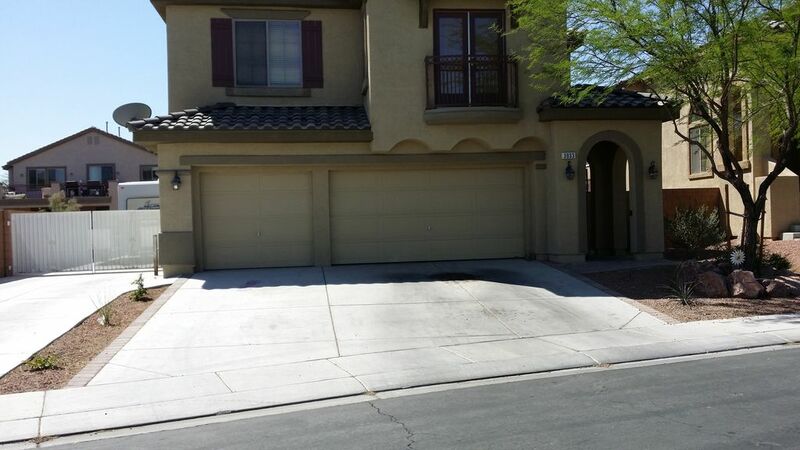 We were a group of 15 members visited Vegas for a bachelors party and the best part we liked in our Vegas trip is this house where we stayed. Thanks a lot for your hospitality and making our trip memorable. New High End Luxury Community with Private Security. Homes are spectacular! Huge homes 3800 sq feet. Everything is close. Strip is 15 minutes away, Around the corner is YMCA, golf, shopping, gas station with store, nail salon, cinema, Wal-Mart, McD, KFC, many restaurants, Hwy access. Just moments from casino and the Nevada Walking Trail. Please purchase trip cancellation insurance in case your plans change.